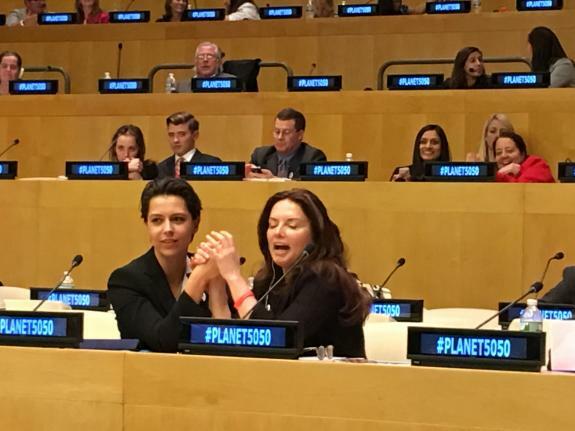 President Sally Kader was invited to participate in the United Nations conference, "Planet 50-50 by 2030: Step It Up for Gender Equality". "Planet 50-50 by 2030: Step It Up for Gender Equality" is a conference for governmental delegations to recommit their nations to address the challenges that are holding women and girls back from reaching their full potential, both in their careers and their personal lives. The conference comes at a critical moment in time, when women are still being held back and discriminated against in many parts of the world. The 2030 Agenda for Sustainable Development provides a comprehensive roadmap for the future development and progress of gender equity, and we look to create new programs to promote women's participation in decision-making, eradicate violence against women and girls, and invest in further national action plans or policies for gender equality.